I haven’t done much in the way of submissions recently because (drum roll) I have been busy writing new stories. They’re all short (some only 140 characters) but are new stories nevertheless and that gives me great satisfaction. So I was thrilled to hear that my submission to Fine Linen, a new Literary Fiction magazine, had been successful. ‘Dressing Up’ is a flash fiction of which I am particularly proud and started as an opening sentence that popped into my mind and wouldn’t leave, as with most of my successful stories. It is a gift that arrives apparently out of the blue and I count myself exceptionally lucky to receive it now and again. Fine Linen Magazine is a curious and original ‘pack’. It consists of several parts, including an A5 magazine containing half the stories and an A3 full colour fold-up broadsheet with the remainder. 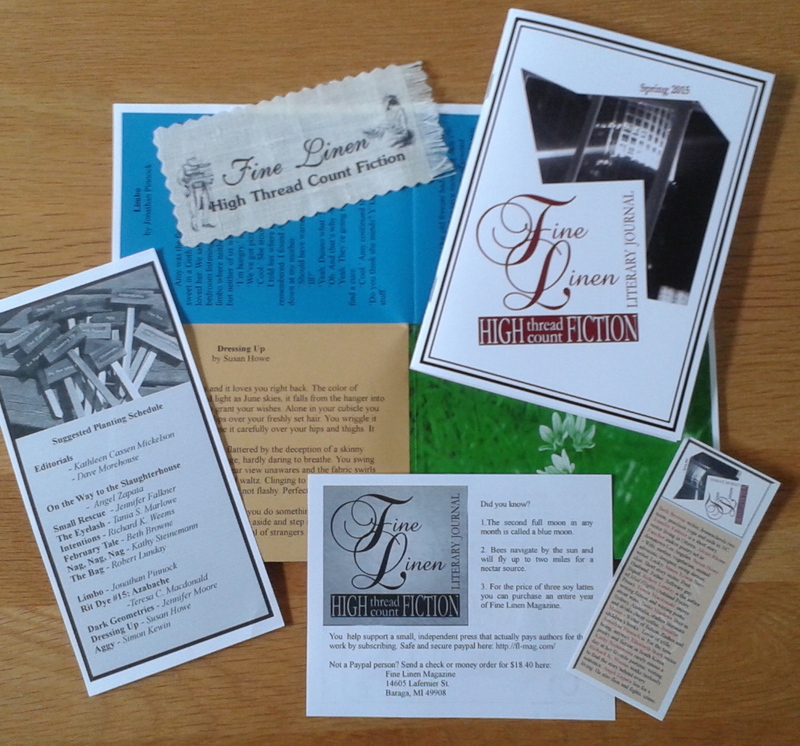 There is also a little factsheet, a suggested reading order, a mini-bookmark displaying ten-word biographies of the issue’s contributors and another linen one. It’s lovely but I’m not sure what to do with it! My other printed pieces are in conventional magazines and anthologies which can be casually(!) displayed on the coffee table or retrieved easily from shelves. Unfortunately, I think Fine Linen will remain in its envelope to keep the elements together and stop them getting dog-eared, which is a bit sad, especially because a remarkable coincidence occurred in this issue. Fine Linen is based in the US and yet two of this quarter’s contributors (myself and Simon Kewin) live fifty yards from one another in a tiny English hamlet! As the list of selected stories numbers only fifteen out of hundreds of submissions, we were astonished to find ourselves back-to-back in the broadsheet. I’d like to think it was because I’ve trained Simon so well but, alas, he has a good many years of publishing successes on me! You can subscribe to Fine Linen by following the link. I was also delighted to be approached by the Editor of a new online Literary Fiction magazine, The Writing Garden, for permission to print ‘Decorated Hands’, which she found on Readwave, in her third issue. This is a story I wrote over ten years ago after sitting opposite a woman with decorated hands on a train following the death of my mother. Everything that happened around that time is still very clear in my mind and the story I wrote, though having nothing to do with death, has a great deal to do with loss. It is a story that has had many lives in print and online and I am so pleased it continues to travel independently. And finally, please get your submissions in to National Flash Fiction Day’s micro competition (100 words) and anthology (500 words) by midnight on May 15th. I have nothing to do with the judging of either of these but you will recognise the names of all this year’s judges if you follow the flashing scene. I’ve got my three hundred-worders in but am still mulling over the theme of ‘Geography’ for the anthology. With only a week to go, I’d better get cracking, and so had you! Please use the links to spread the word. That is truly bonkers, Tracey! Have you tweeted him? No, have sent a Facebook friend request as we have some mutual friends on there. FlashFlood – here it comes again!